Marrying the imperial princess wasn’t my idea, but it will stop a war between our nations. I didn’t expect to actually like her, though. She’s nothing like I expected. Almost as though she isn’t a princess at all. Instead of being vain and self-obsessed, she’s shy, frightened, vulnerable… and amazing. Her passion, her inner strength, everything about her calls to me, makes me want to claim her as my mate. Together we could stand against anything. I can tell she’s keeping something from me, but what secret could she be hiding? Being abducted by aliens was bad enough, and now I’m supposed to marry one? He’s an alien prince, proud and arrogant, and worst of all he thinks I’m some kind of space princess! All I have to do is keep up the disguise until I can get away and back to Earth. But the longer I’m with Xendar, the less I want to escape. It’s hard to think about leaving when I’m wrapped in his arms, held against his incredible body. He’s not the only problem, though. Someone doesn’t want the prince and princess to have their happy ever after, and they don’t mind killing us both to stop it. If Xendar can’t keep us both safe, my secret won’t matter to anyone! 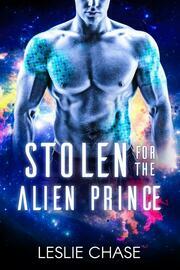 Stolen for the Alien Prince is a standalone science fiction romance. Happy ever after ending guaranteed!